Wellington, FL – March 18, 2018 – The tenth week of competition at the 2018 Winter Equestrian Festival (WEF) concluded with a win for Laura Chapot (USA) and Chandon Blue in the $35,000 Hollow Creek 1.50m Classic CSI 3* on Sunday, March 18, at the Palm Beach International Equestrian Center (PBIEC) in Wellington, FL. The $35,000 Hollow Creek 1.50m Classic saw 53 entries contest the track set by Michel Vaillancourt (CAN), with 14 advancing to the shortened jump-off track. Over the short course, it was Chapot aboard Chandon Blue, a 13-year-old Oldenburg gelding (Chacco Blue x Landcapitol) owned by Mary Chapot, who turned in the winning time of 36.145 seconds. Second place went to Hunter Holloway (USA) and VDL Bravo S, a 12-year-old KWPN gelding (Ephepe For Ever x Chellano Z) owned by Hays Investment Corp, with a time of 36.565 seconds. With American ladies taking all three of the top spots, it was Lillie Keenan who finished in third with a time of 38.647 seconds riding Concho, a ten-year-old Holsteiner gelding (Cassaro 5 x Acord II) owned by Chansonette Farm LLC. Chapot acquired her winning mount, Chandon Blue, from Irish rider Cian O’Connor in December of 2017, and she has used the 2018 WEF season to get to know the gelding. The last day of week ten at the Winter Equestrian Festival featured an exciting win for Emma Vandenhouten and her own entry, Spiderman, who earned the championship in the Rosenbaum PLLC Large Pony Hunter division. The pair secured the title with a sixth on the flat and a first, first, and seventh over fences. 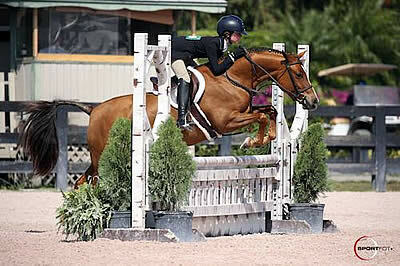 The junior rider first began her journey to the top with Spiderman in the Large Children’s Pony Hunter division over a year ago, and the duo has continued to progress. Laura Chapot and Out of Ireland. Photo © Sportfot. Wellington, FL – January 12, 2018 – Laura Chapot (USA) and Out of Ireland out-paced a field of 91 entries to win the $6,000 Bainbridge 1.40m Speed Challenge on Friday, January 12, concluding the third day of competition at the 2018 Winter Equestrian Festival (WEF), held at the Palm Beach International Equestrian Center (PBIEC) in Wellington, FL. Of the 91 entries in Friday’s $6,000 Bainbridge 1.40m Speed Challenge, 16 jumped the Eric Hasbrouck-designed course without fault, but speed was the name of the game, and none proved able to catch Chapot and Out of Ireland, owned by The Edge and Laura Chapot. Chapot and the 11-year-old Anglo European mare went 19th in the order, tripping the timers in 64.681 seconds and setting a time to beat that would go untouched for the remainder of the class. The Adult Amateur Hunter Younger division finished with Phoebe Backman claiming the championship title aboard Destiny, her mount of three-and-a-half years. The pair took first and second place in Thursday’s jumping classes, and Destiny claimed second and third over fences and fourth under saddle on Friday with rider Tracey Gorin-Byrne. Laura Chapot and Out of Ireland. Devon, PA – September 15, 2017 – Horses and riders returned to the Dixon Oval for another shot at the prize money for the 2017 Devon Fall Classic. Both the $5,000 Speed Stake and the $1,000 High Junior/Amateur-Owner Jumpers were run as pure speed classes, pressuring competitors to lay down a quick and clean first trip. The largest check of the night ultimately went to Laura Chapot, who piloted Out of Ireland to the winner’s title in the $5,000 Speed Stake. Lucy Matz and Bailey VI bested the field in the $1,000 High Junior/Amateur-Owner Jumper class to ride away with the blue ribbon as the leading pair. Capping off the evening under the lights as the most prestigious class of the day, the $5,000 Speed Stake challenged each contender to ride an effective trip over the 1.40m fences faster than the rest of the pack. Course designer Paul Jewell proposed a lofty series of obstacles to the horses and riders, proving no issue for Chapot and Out of Ireland, owned by The Edge, who blazed through the track in the unbeatable time of 60.446 seconds as the third to enter the ring. Though a series of competitors managed to keep all the rails in the cups for clean trips, none managed to surpass Chapot and Out of Ireland’s clean time except Chapot herself, who nearly outdid herself in the class aboard Mary Chapot’s Zealous. As one of the last to go, Chapot and Zealous laid down a strong performance and the quickest trip of the night in 59.971 seconds, the only pair to break 60 seconds, but unfortunately Zealous clipped the jump standard on a tight turn, toppling the rails to accumulate 4 faults against them. Ibrahim Barazi and IB Stables’s Softbeat took their turn around the track two trips later, and it appeared that Barazi and his mount may give the early leaders reason to worry until a rail fell near the end of the course, with the pair finishing on 4 faults in a quick 61.125 seconds, the only pair at that point to come within a second of Chapot and Out of Ireland. The second-to-last to go, owner-rider Pablo Mejia and RL Queen Mary looked to pose the greatest threat to Chapot, crossing the timers in a nail-biting finish with all the rails still up, but unfortunately just a half-second too slow in 60.913 seconds, securing Chapot and Out of Ireland’s spot atop the scorecard. Mejia and RL Queen Mary nabbed the second position behind Chapot and Out of Ireland in the victory gallop, followed by Barazi and his own Omnia Incipit, who finished in a clean 64.183 seconds to claim third position. Chelsea Babcock and Da Vinci, owned by Empire State Equine Sales, LLC, claimed fourth place with a clean time of 66.571 seconds, and Willie Tynan Red Barn Farm, LLC’s KEC City Limits rounded out the top five with their time of 67.228 seconds. Earlier in the evening, Matz and Bailey VI, owned by Dorothy Matz, made their mark on the 2017 Devon Fall Classic with a win in the $1,000 High Junior/Amateur-Owner Jumpers. Matz and Bailey VI coasted around the track in a speedy 63.950 seconds, leaving the course intact and setting the standard for the remaining athletes. Three seemed to be a lucky number as, just like Chapot, Matz rode third in the order of go. Jesse Smith and her own Charles Pinckney Windsor Z gave the early leaders a run for their money with their clean ride, but tripped the timers a bit too slowly in 64.518 seconds. With only one pair left to ride, Matz and her mount’s time still stood at the top of the leaderboard as Cynthia McGrath and Mapledale Associates, LLC’s Quinaro, who won the High Junior/Amateur-Owner Jumper class, entered the ring. Though McGrath and the towering Quinaro navigated the course faster than any other entrants, stopping the clock in 63.704 seconds, Matz and Bailey VI remained unparalleled as McGrath and her ride rolled rails to drop to fourth position overall. Smith and Charles Pinckney Windsor Z retained the reserve position, followed by owner-rider Adrienne Marciano aboard Laspari, who finished in 70.380 seconds with 4 faults. McGrath claimed fourth and fifth place with Quinaro and Caruso, respectively.